How exciting to be writing my first WIP post of the new year! One of my WIPs is actually a finished object now, but my second WIP is a kind of ‘partner in crime’ to it so I’m not posting a photo of it until they are both complete. The first WIP (the now finished one) was a hot water bottle cover for me. I had a tonne of yarn left from my blooming flower cushion so I decided to push the boat out and make more coordinating accessories. I went for a relatively simple free pattern using stripes, and it has worked out quite nicely. I used all four colours from the cushion in roughly equal amounts to keep it fairly balanced, but chose duck egg blue for joining. I have no idea what this stitch is called, but it’s a free pattern from Ravelry. Mr C then decided he wanted a cover for his hot water bottle too. I didn’t want to make an identical one, so I showed him some photos of stitches and he quite liked block stitch. I’ve chosen graphite (darker grey) as the colour for the double crochet stitches, and I will use it for joining and for the top part of the cover. Hopefully that will give it more of a masculine feel too. 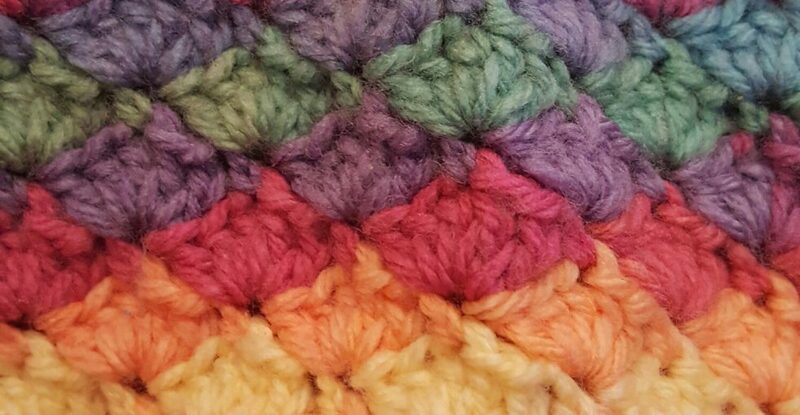 I am dreading sewing in the ends and will most probably deal with them in stages so that it isn’t too painful.So far I quite like how the stitch looks, although I think my tension on the double crochets leaves a little to be desired as there are a few unsightly gaps. Hopefully this will improve as I go along as I only started it this evening. What are you working on? Have you started a new project for the new year? I’d love to hear, I’m on Instagram too @craftandothercrazyplans if you want to share on there. Lovely new projects. I am still crocheting blankets started last year. Thanks, I’ve got a blanket to finish too! Thank you, it’s a nice easy one to work. Linen stitch was on my list of potential ones for Mr C’s hot water bottle cover, I think it looks so neat. Linen stitch would also be good for a hot water bottle cover as it is tightly woven and nice and thick – quite manly too, like block stitch! It is a gorgeous stitch, I’m sure I’ll find an excuse to try it! Love all your hand work…so busy you are. Thank you, enjoy your celebrations! Thank you, I’m a bit in love with the colours too, they’re just how I wanted them to be. They both look like very beautiful stitches and I am sure that the final result will look great! I haven’t started anything new this year yet as I am not feeling well right now and I also have several WIP-s still left to finish. Thank you, get well soon. Looking forward to seeing both projects! Thanks, I think the block stitch one might take me a while! Those look so nice, I really do love those colours, they’re so calming. Thank you, I’m hoping so. I love the look of the stitch on your hot water bottle. They look like little birds or leaves to me. I’ve downloaded the pattern now from the link. It’s funny how the stitches don’t look so defined in the pattern. I love how yours looks, and the colour combination. I’m currently dithering with my crochet! I have 3 wips but really I want to start to make a sheep from some wool from my stitching santa parcel. This means I actually crocheting nothing at all… Which is silly! That said, I’ve been sewing lots, which I’ll blog about today as I’ve made things for my blogiversary giveaway! That’s handy to know if I try to replicate it at some point. I think finishing my projects might be a year long task! Thank you. I find socks are slow, even though they’re lovely to wear at the end. Beautiful stitches on both water bottle covers and I just love those colors as I did on your cushion. I am soooo jealous that you received a Silhouette for Christmas! I have been wanting one, but haven’t heard too much about it personally. I can’t wait to hear all about it; ie how you like it, is it easy to use and seeing what you create with it. Thank you, the silhouette is amazing. I’ve tried loads so far! I really must type a post about it. Your crochet is lovely- the stitch, the colors, everything. I recently learned to crochet and while I am more familiar with knitting, I can’t say which craft I enjoy more! Gorgeous! The hot water bottle covers will be lovely together! Great projects. Lucky you to get a new toy to play with. Thank you, I feel very lucky!